Relevant, profound & progressive Judaism Welcome to Mishkan Shalom, a Reconstructionist /Reconstructing Judaism congregation dedicated to repair of the world through prayer, study and acts of caring. At Mishkan Shalom, you’ll find profound and dynamic services, life cycle events and Jewish cultural celebrations, a vibrant congregational school and teen program and a shared commitment to social justice that’s grounded in Jewish values and texts. Traditions for today People from a wide range of observance and backgrounds are drawn to the congregation’s Reconstructionist approach to Judaism, Jewish holidays, Jewish ritual, and life’s celebrations and sorrows. The Reconstructionist movement, founded by Mordecai Kaplan in the early 20th Century, reexamines Judaism’s traditions, texts and rituals to meet the needs of contemporary life. Click here to read some Frequently Asked Questions about Reconstructionist Judaism. Mishkan Shalom was founded in 1988 with a Statement of Principles that expresses the synagogue’s commitment to integrating three areas of Jewish life: Torah - study, Avodah – prayer and G’milut Hasadim/Tikkun Olam – acts of caring and repair of the world. Now, in 2015, we are proud to say that our Statement of Principles still hold. In fact, we invite prospective members to read them as part of the membership process. We are rich in diversity – in Jewish observance, faith, family structure, ethnicity, political viewpoints, income and where members live. People from traditional Jewish backgrounds and families value the congregation’s embrace of those who may have felt excluded or invisible in other Jewish settings such as interfaith families, Jews by choice, Jews of color, single Jews, families formed by adoption, single parent families, Jews with disabilities, Jews with limited means, those with little familiarity with Jewish practice and gay/lesbian/bisexual/transgender Jews. Where ever you are in your journey to find meaning in Judaism, you’re welcome at Mishkan Shalom to share your faith and doubts, to pray, learn and teach. 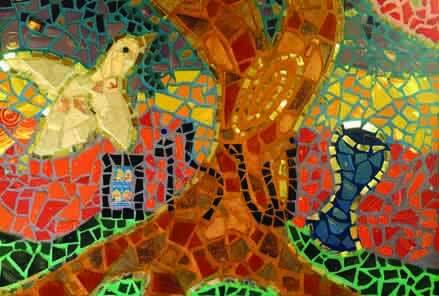 Sanctuary of Peace The Hebrew phrase Mishkan Shalom means sanctuary of peace – reflecting a core commitment to social justice and to creating an atmosphere of mutual respect in which congregants may discuss different opinions about difficult issues while remaining a community. Tikkun Olam is the hallmark of Mishkan Shalom’s history and identity. Ethical themes in Jewish observance, prayer and study inform congregants’ efforts to create meaning and healing in their own lives, and to work toward healing what is broken in the world. Reflecting the central place of Israel in Jewish life, Mishkan Shalom hosts speakers with a range of perspectives who encourage respectful dialogue and explore topics related to Israel’s history and culture, and the shared humanity of Israelis and Palestinians. About our Building Located in a renovated mill in the Roxborough-Manayunk neighborhood of Philadelphia, Mishkan Shalom’s architecturally striking building, and adjacent outdoor amphitheater and gardens, reflect simplicity and environmental stewardship. The sanctuary features a solar powered ner tamid (eternal light); and the building has received an Environmental Protection Agency Energy Star award for energy efficiency. The building is available for rental, click here to learn more about meetings, workshops or even weddings! In addition, we have a number of policies relevant to the use of our building. Please click here to learn more.